We’ve seen the Wheeled Flatbed Cart and the Heavy Duty Foldaway Cart to help heave-ho heavy plants around the garden, but if there are stairs involved, best roll-in the Potted Plant Hand Truck. Specially designed to easily transport potted plants weighing up to 110 lbs, this wheely wonder features a nose plate that slides under pots, and a height-adjustable two-pronged pot rim clamp – which work in unison to secure planters up to 30″ high x 20″ in diameter. 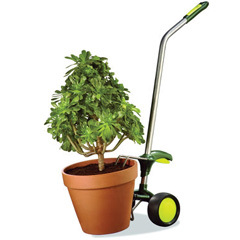 With tires that’ll easily roll your pot plants across lawns, over driveways and even up stairs, the Potted Plant Hand Truck will literally take your gardening to a new level. Urban agriculture, ftw! Including a foldaway noseplate and a handle loop, the Potted Plant Hand Truck hangs unobtrusively in your garage or shed and is available now from Hammacher Schlemmer for $79.95. Bloomin’ brilliant!